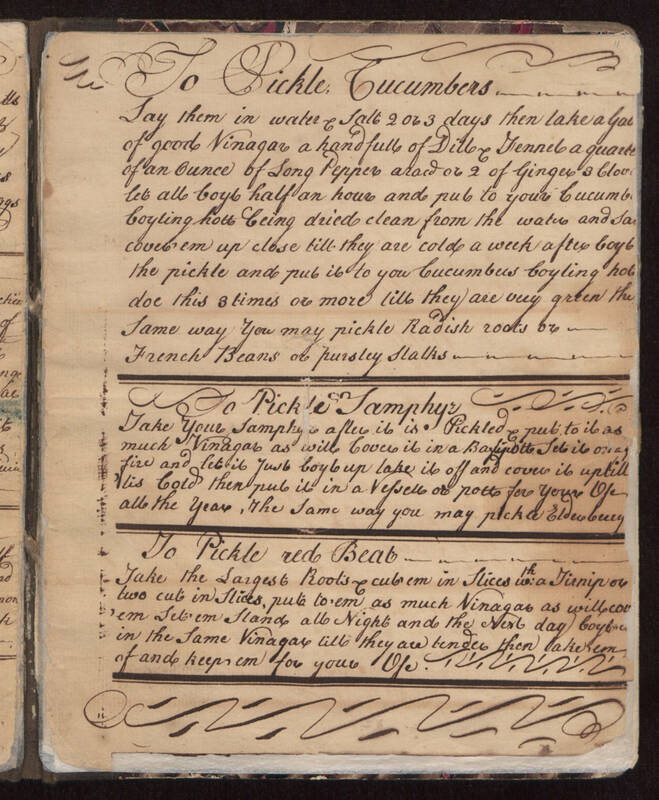 To Pickle Cucumbers Lay them in water & Salt 2 or 3 days then take a Gal of good Vinagar a handfull of Dill & Fennel a quarter of an ounce of Long Pepper a [illegible] or 2 of Ginger & Cloves let all boyl half an hour and put to your Cucumbers boyling hott being dried clean from the water and [sauce?] cover 'em up close till they are cold a week after boyl the pickle and put it to you Cucumbers boyling hot doe this 3 times or more till they are very green the Same way You may pickle Radish roots or French Beans or parsley Stalks To Pickle Lamphyr Take Your Lamphyr after it is Pickled & put to it as much Vinagar as will cover it in a [Basipott?] Set it on a [illegible but I think that it may be "quick"] fire and let it just boyl up take it off and cover it up till 'tis Cold then put it in a Vessell or pott for your use all the Year, the Same way you may pickle Elderberry To Pickle red Beat Take the Largest Roots & cut 'em in Slices w:th a Tirnip or two cut in Slices, put to 'em a much Vinagar as will cover 'em Let 'em Stand all Night and the Next day boyle in the Same Vinagar till they are tender then take 'em [illegible] of and keep em for your use.